It is a frustrating feeling to encounter trigger mousetraps that have not caught any mice at all. What’s even more frustrating is finding out that they have eaten all the bait and have successfully escaped. Mousetraps that do not trap the mice are useless; you are essentially providing free food for the mice and are encouraging them to call your house their home. The classic spring traps and the humane rat traps have been proven to work, but a lot have false triggers or are just accidents waiting to happen. This is why through innovation and need, the market is now teeming with another trap kill option: the electronic zappers that instantly and humanely kill rats, mice, and other similar rodents. These boxes attract, trap, and kill rats easily which is why they are becoming the more popular kill traps rather than the classic spring traps. The problem with zappers is that there are now so many of them on the market that it is hard to choose which one you should use at home. This review will give you an inside look into the Pestrax Electronic Mouse Trap to give a better idea of what to expect when you purchase this zapper. What makes the Pestrax Electronic Mouse Trap stand out from other similar zapper traps is its ability to also trap larger rodents like squirrels and chipmunks, not just mice and rats. This means that it is an all-around trap that can be used for both indoor and outdoor settings to completely get rid of all the rodents that are bothering you. Since there is no need to clean the zapper after disposing of the dead rodents, they are easily set to capture, stun, and kill immediately, making the process of rodent eradication faster and easier. The powerful zap of this device also allows for the fast, humane, and near painless death of rodents. There is no need to worry about their suffering inside the cage because the 7,000 volts is more than enough to kill them. Even if they are killed, contact with the dead rodent is minimal because they are easily dumped out of the cage and into a trash can, making it very convenient. There are also no stains, odors, or blood on the trap which lessens the chances of spreading diseases. Those with small children and pets can also stop worrying because this zapper trap is safe, unlike traditional spring traps and glue traps. Although it is still suggested that children and pets are kept away from the trap when turned on, they are not as dangerous when compared to other traps. Finally, since the trap works on batteries it is easily transported making it very handy. When it comes to zap traps, its effectiveness and humaneness is still debated. Many still think that shocking a rodent isn’t humane and have issues with this form of mouse trap. This is somewhat true because there are instances where the shocks delivered aren’t powerful enough to stun or kill. It can cause injury, but the rodents still find a way to escape with free food. Another common issue with this mousetrap and those similar to it is the excessive use of the battery. Although the trap can stand up to 30 kills per battery change, that is normally not the case because the trap consumes energy even when it does not catch any prey. Batteries that are left inside the device for a prolonged period may also leak and damage the trap. Be extra careful and check the zapper to ensure it is in good working condition before setting it for the night. When it comes to a long-term rodent solution, a reusable device is a surely a great investment. It will make getting rid of an infestation easier and faster. And with the Pestrax Trap, you have one of the best solutions currently available in the rat zapper category. SMART CIRCUIT TECHNOLOGY - Protect your home with the most effective rat zapper ever! Recently upgraded for 2018, Pestrax's innovative automatic technology eliminates escape attempts for good. 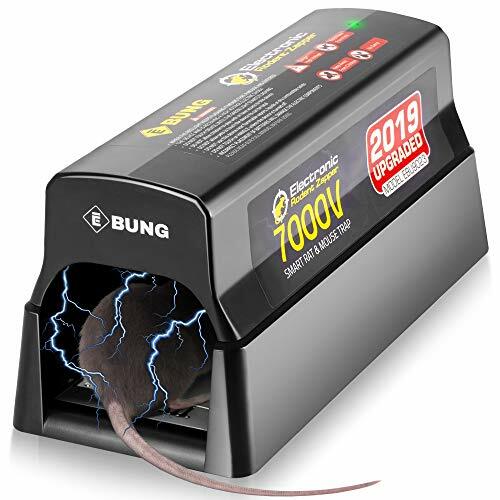 Designed to detect when a rat or rodent enters the trap, it immediately administers a lethal 7000-voltage electric shock to stop pests in their tracks. OPERATE WITH EASE - Kiss confusing contraptions and expensive exterminators goodbye! You place the bait and Pestrax's electric rat trap does the rest. Put peanut butter, nuts, or dry pet food in the trap, turn on with the safety-enhancing power switch, and let the trap do the zapping! Rats just can't resist it! THE NON-TOXIC ALTERNATIVE - Rodents are already an inconvenience, so don't let them kick you out of your home, too! Chemical rat poisons aren't safe for you or your family. 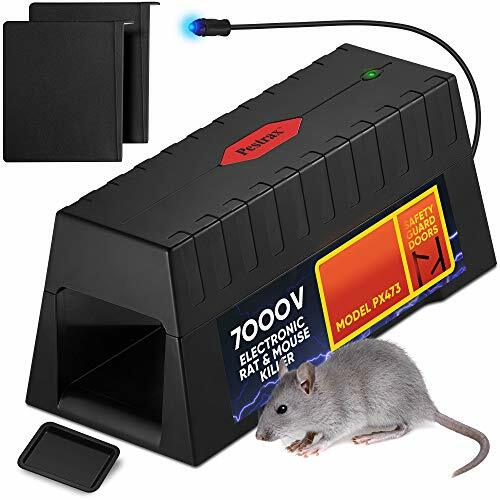 Avoid extra burdens and eliminate health hazards by trusting your Pestrax electronic mouse trap to safely and humanely eradicate rats and other vermin! LIVE PEST & MESS FREE - Rodents carry disease, and ordinary rat, mouse, and squirrel traps leave gory remnants that put your family at risk. Shed the mess and opt for Pestrax's hygienic electric rat traps, designed for safe disposal. Simply discard by turning over into the trash, then easily reset!